Jim Matus, with Latvian singer Laila Salins, who recently toured with her highly acclaimed project “Tango-Ballads: NY-Riga”. Also joining us is the celebrated world music percussionist, Shane Shanahan (Silk Road Project, Glen Velez) . Talamana developed music for the Amber Road Project (Dzintara ceļa projekts). The name of the group draws from the Indian rhythm concept of tāla - which also means “distant” in Latvian - both deriving from Sanskrit roots. 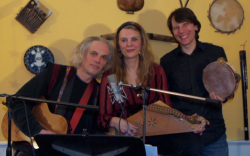 MAWWAL is a spirited acoustic/electric ensemble that performs original progressive music, beautiful trance-inducing world fusion and original arrangements of traditional Middle Eastern music in what has been called a "new genre" by Progression Magazine. Festival appearances include The Garlic and Arts Festival in Orange, MA, The Better World Festival, Northampton Mass, The Festival of Arts and Ideas in New Haven, Ct, The Project Troubadour Festival in Lakeville, Ct, Summer Wind’s “Hartford’s Rising Stars”, Mawwal recently performed live on WAMC's Preformance Place, a popular NPR music program.